This repository update so quickly, please make sure that your fork is up to date. This repository will implement the classic and state-of-the-art deep reinforcement learning algorithms. The aim of this repository is to provide clear pytorch code for people to learn the deep reinforcement learning algorithm. In the future, more state-of-the-art algorithms will be added and the existing codes will also be maintained. If you need me help you implement RL, you can send a email to me. 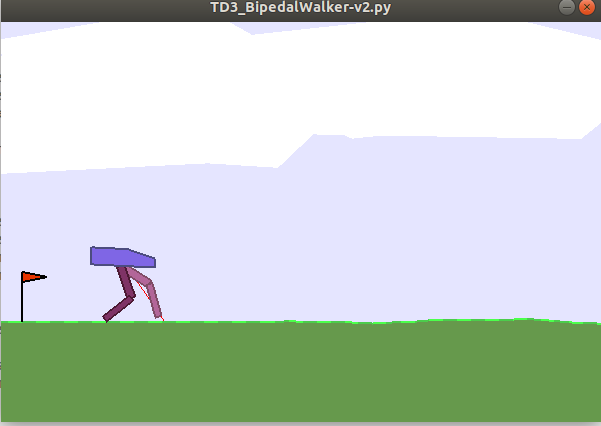 You could see a bipedalwalker if you install successfully. Here I uploaded two DQN models which is trianing CartPole-v0 and MountainCar-v0. This is a sparse binary reward task. Only when car reach the top of the mountain there is a none-zero reward. In genearal it may take 1e5 steps in stochastic policy. You can add a reward term, for example, to change to the current position of the Car is positively related. Of course, there is a more advanced approach that is inverse reinforcement learning. This is value loss for DQN, We can see that the loss increaded to 1e13, however, the network work well. Because the target_net and act_net are very different with the training process going on. The calculated loss cumulate large. The previous loss was small because the reward was very sparse, resulting in a small update of the two networks. This is a model that I have trained. This is an algorithmic framework, and the classic REINFORCE method is stored under Actor-Critic.